The notion of exactly (or approximately) representing certain combinatorial properties of a graph $G$ on a simpler graph is ubiquitous in combinatorial optimization. In this talk, I will introduce the notion of vertex sparsification. Here we are given a graph $G = (V, E)$ and a set of terminals $K \subset V$ and our goal is to find one single graph $H = (K, E_H)$ on just the terminal set so that $H$ approximately preserves the minimum cut between every bi-partition of the terminals. The Davenport-Heilbronn function (introduced by Titchmarsh) is a linear combination of the two L-functions with a complex character mod 5, with a functional equation of L-function type but for which the analogue of the Riemann hypothesis fails. In this lecture, we study the Moebius inversion for functions of this type and show how its behavior is related to the distribution of zeros in the half-plane of absolute convergence. Work in collaboration with Amit Ghosh. Current educational policy discussions frequently invoke “equality” as the reigning ideal. But how clear a view do we have of what we mean by this? What exactly are we trying to achieve? 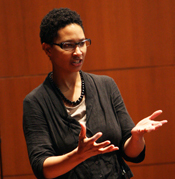 In this lecture, Danielle Allen, UPS Foundation Professor in the School of Social Science, revisits the question of how to understand the ideal of equality in the context of educational policy. In 1970s Paul Erdos asked the following question: Consider all the boolean strings of length n. Assume that one has chosen a subset S of the strings such that no two chosen strings are different in precisely n/4 (or its closest even integer) coordinates. How big can the set of chosen strings be? Erdos conjectured that the answer is small (in a precise sense) and put a $250 prize for a solution. In 1987 Frankl and Rodl proved a strong form of this conjecture showing that such a set has to be exponentially smaller than the set of all strings of length n.